Check out the Tops Weekly Ad, valid April 14 – April 20, 2019. 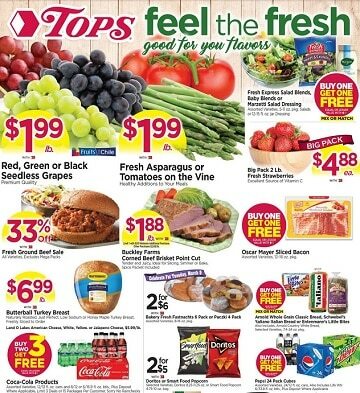 Don’t miss the Tops Flyer Sale and grocery promotions & deals from the current Ad Circular. Find amazing meal deals and free grocery items when you buy select products and also get super savings for frozen food, fresh meats & seafood, bakery & deli, organic produce, cheese, dairy, floral, ice creams, Open Prairie Angus Beef, President Cheese, Prego Pasta Sauce, New England Coffee, Tide Simply Liquid Detergent, and much more.